Sits, sleeps sniffs the ground and scratches itself. Occasionally digs at the ground, and howls. Very rarely dances. Brief heart animation over Nibbles' head when the player summons the Illidari Felstalker mount. 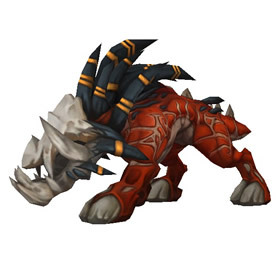 This pet is a free gift for purchasing the Legion Collector's Edition or the Legion Digital Deluxe. The Collector's Edition will be sold in stores (in limited quantity). I named him "twenty dollars"
If you have Nibbles out and you summon the illidari felstalker mount, Nibbles will do the heart emote. You can obtain Nibbles now if, you pre-purchase WoW: Legion and it's breed is P/S. This young stalker was easily swayed from Sargeras' grasp by a handful of Magical Mini-Treats.